New Delhi: Parliament approved the Unorganized Sector Workers’ Social Security Bill, intended to provide social security and job protection to at least 375 million workers. 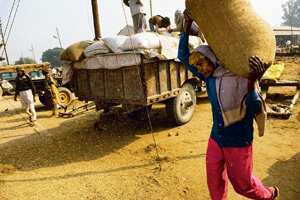 The UPA government barely managed to get the legislation, which ensures the welfare and well-being of workers in the unorganized sector, including those in agriculture, construction, tobacco, handloom and leather, passed in the Lok Sabha after rejecting pleas by the Left parties for votes on two amendments. The amendments would have created a national welfare fund and extended health and insurance schemes for the workers. “Under the Bill, the Centre and the states will constitute social security advisory boards to recommend suitable welfare measures for different sections of unorganized sector workers and the central government would notify suitable welfare schemes relating to life and disability cover, health and maternity benefits etc to them," said labour minister Oscar Fernandes. A worker will have to register his name to avail the benefits and will get a smart card with a unique identification number. Both the Centre and the state governments are to formulate schemes to provide so-called provident fund, an employment injury benefit, housing, educational schemes for children, skill upgradation of workers, funeral assistance and old age protection for the workers. The government has identified 11 programmes, including national old age pension scheme, national maternity benefit scheme, health insurance scheme for handloom weaver, aam admi bima yojana or insurance for citizens, that will be encompassed by the Bill. Hannan Mollah, the Communist Party of India (Marxist) MP, who has been advocating a legislation for the unorganized workers for the last 27 years, dubbed the Bill, passed earlier by Rajya Sabha, as “cosmetic." “The government has just adopted the terminology and vocabulary of the legislation we have sought for, but the content is not there," he claimed. “This Bill will not even cover 90% of the total workforce in the unorganized sector." “Most of the workers under the unorganized sector do not belong to the BPL category, which means 90% of the workforce will not be covered by the legislation," Mollah said. India’s $52 billion textile industry, for example, is one of the largest employers, after agriculture, with 35 million jobs and some industry representatives admit that a majority of its workers don’t have either labour protection or social benefits. “Within the sector, loopholes in the law are exploited to keep benefits outside the ambit of social measure. This has a lot to do with implementation," said Gautam Nair, managing director of apparel company Matrix Clothing Pvt. Ltd. Still, many employers claim states are less concerned about implementing social benefits and more focused on raising minimum wages as a way to score points. Employers claim such hikes are making India less competitive with countries such as Bangladesh and Vietnam. Meanwhile, there is still the issue of multiple government departments ending up at cross purposes. The ministry of micro, medium and small enterprises, for instance, has been opposing the labour ministry’s move to bring all units employing more than 10 people under the Employees Providents Fund, or EPF, maintaining that small businesses do not have financial power to support it. Such benefits are extended to units that employ 20 people and more. While both trade unions and non-profit organizations welcomed the Bill, they said it is insufficient to guarantee social security protection. “The Bill does not clearly define social security as a right. At present, the Bill is like a scheme, something the government can modify or change anytime. We want this right to be mentioned in the act," said J. John, member of Social Security Now, a consortium of about 500 organizations that work for labour rights. Many said the Bill lacks detail and responsibilities for implementing the schemes are not clearly defined.